UNRWA provides education, healthcare, job training, and limited food aid for millions of Palestinian refugees in the Middle East, the majority of whom are descendants of those Israel forcibly displaced from their homes in historic Palestine in 1948, in what Palestinians refer to as the Nakba (catastrophe). Unlike most UN agencies, the entirety of UNRWA’s operational budget comes from voluntary contributions by member states. The US has historically been UNRWA’s biggest donor, last year providing about one-quarter of its $1.24 billion budget. The US refusal to contribute is therefore potentially catastrophic for its recipients. Yet while Trump’s rejection of “globalism”  and the Administration’s particular hostility to refugees provides context for its actions against UNRWA, this decision has a more specific target: The attack on UNWRA is part of a full-spectrum assault on the Palestinian people’s political claims and its capacity to engage in politics undertaken by the Trump administration since entering office in 2016. While the President’s son-in-law Jared Kushner is reportedly developing a Middle East peace plan, dubbed the “deal of the century,” the administration has spent most of its time trying to preempt negotiations by imposing “resolutions” to final status issues such as Jerusalem—reflected in its decision to move the US embassy to the contested city—and now in the attack on the livelihood and status of Palestinian refugees, as well as weaponizing financial aid to coerce the Palestinians into negotiations on the basis of compliance with the US and Israel’s demands. But the specific attack on UNWRA also reveals a deeper target. Although UNRWA is an international organization, rather than a Palestinian body, the Trump administration’s targeting of its operations reflects its significance for Palestinians, which exceeds the services provided, as important as these are. Palestinian refugees have long viewed the existence of UNRWA as an acknowledgment of international responsibility to address their plight. At the same time, they have also worried that this plight might be viewed as a merely humanitarian concern, rather than a fundamentally political issue which demands redress. As early as 1949, refugees expressed concern that “the Palestine affair is no longer a matter of liberating a country. It has degenerated into a humiliating problem—that of feeding and sheltering refugees.”  Refugees’ need for assistance was a consequence, they have insisted, of a massive injustice done to them—the 1948 displacement of most of Palestine’s native population, their dispossession of their property, and the dissolution of a Palestinian polity. Addressing their needs requires redressing this injustice through recognition of their right of return enshrined in UN Resolution 194. 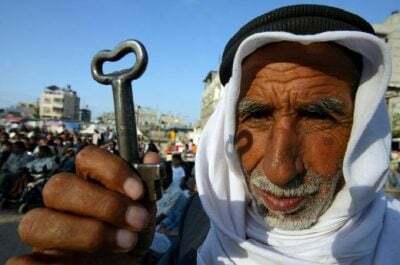 It is the Palestinian refugees’ demand for recognition, rights, and a political resolution to the injustice of their century-long dispossession at the hands of Israel, therefore, that is the ultimate target of the Administration’s decision to revoke funding for UNRWA. If Palestinians were willing to be passive recipients of aid, making no demands, and having no collective expectations, the Administration’s appetite to spend money would no doubt be greater. Rather, the “flaw” that drove the Trump administration to this decision resides in the actual recipients of UNRWA programs–Palestinian refugees—and, more specifically, who can be counted as a Palestinian refugee, and thus, who can be entitled to international aid and political recognition. The State Department’s announcement to cease UNRWA aid focused its ire specifically on what it claimed to be the “endlessly and exponentially expanding community of entitled beneficiaries.” This contemptuous language about “an expanding community” of refugee beneficiaries reflects years of efforts by right-wing pro-Israel organizations such as the Middle East Forum to dissolve the Palestinian refugee category in order to remove the Palestinian refugee issue from political discussion. In line with right-wing Israeli government positions, these organizations have sought to impose the unique requirement on UNRWA that refugee status should be denied to descendants of the displaced, resulting in several Congressional resolutions demanding the State Department limit its count of Palestinian refugees to only those who were displaced in 1948. Previous administrations have rejected this demand. The aim of narrowing the refugee category to the far smaller number of now elderly refugees is to make the refugee problem disappear as the nakba generation—those who were driven out of their homes in 1948–passes away. Congressional insistence that the State Department redefine a Palestine refugee, and ultimately dissolve the category altogether, and now State Department insistence that UNRWA do so, both fail to acknowledge that this decision is not in the hands of either the US government or UNRWA. Rather, UNRWA’s existence, its mandate, and its constituency are authorized—and are regularly re-authorized—by the UN General Assembly. And, unlike in the Security Council, the United States does not have veto power there. The longstanding efforts by Israel and its backers, now joined by the Trump administration, to re-define and ultimately dissolve the category of Palestinian refugees correctly recognizes the political importance of the refugee category. And those who want to support both Palestinian refugee assistance and their demands should not shy away from recognizing its political importance either. Palestinians have insisted that meeting their needs is both a political obligation of the international community and an acknowledgment of Palestinian national claims. As a humanitarian organization, with significant limits in mandate and in capacity, UNRWA has never been able to respond to these claims in a manner Palestinians find satisfactory. But the fact that Palestinians continue to press claims—and use humanitarian idioms, instruments, and institutions to do so—has long made UNRWA a target of attack by Palestinians’ enemies. Thus, the Trump administration’s cessation of contributions to UNRWA is intended precisely to put the multiple aims of Palestinian refugee politics—which are undeniably in tension—into outright conflict. By fully embracing the Israeli position that financial assistance to Palestinian refugees is a political threat to be terminated, the administration’s attack on UNRWA is an attack on Palestinian political claims (most directly the refugees’ right of return enshrined in international law) and on the Palestinian capacity to engage in politics. If people’s children cannot attend school, if they cannot receive medical care, then perhaps they will give up on their political efforts to seek redress. As politically resilient as Palestinians have been over their decades of displacement, this threat is not an idle one. Faced with numerous barriers to connection across the multiple places where Palestinian live, with communities in Gaza and Syria confronting acute crises, with other populations experiencing chronic deprivation, and in the absence of a political leadership up to the task of confronting these diverse and difficult conditions, Palestinian political community is arguably at one of its lowest points since 1948. It is true that, as the State Department cessation announcement states, “Palestinians, wherever they live, deserve better than an endlessly crisis-driven service provision model. They deserve to be able to plan for the future.” The Trump Administration and the Israeli government, however, envision planning as acquiescence, and seek to dictate what that future will be. The reinstatement of UNRWA funding is a matter of vital importance—not only as a humanitarian gesture, or for reasons of regional stability, as the Democratic congressional letter puts it—but as a rejection of this refusal of Palestinian politics—their political claims and the capacity to advocate for themselves. One can be cognizant of the negative effects of humanitarian aid on Palestinian lives, as well as of the criticism refugees have directed at UNRWA, and also reject the Administration’s attack on Palestinians through its targeting of UNRWA. Palestinians have been able to hold multiple positions and pursue multiple aims, at the same time, and so should those who support them. State Department Spokesperson Heather Nauert, “On U.S Assistance to UNRWA,” US State Department Press Statement, August 31, 2018. People displaced in 1967 [nazihin], and their descendants, receive some assistance from UNRWA, but the Agency’s refugee category is limited to people, and their descendants, displaced in 1948 [laji’in]. UNRWA, “Ministerial Meeting on UNRWA Raises Remarkable US $122 Million,” September 28, 2018. Congress of the United States, “Letter to State Department,” September 28, 2018. “DealBook Briefing: Trump Rails Against Globalism,” The New York Times, September 26, 2018. Recently enacted legislation which makes recipients of US-aid vulnerable to suit in US courts could make it impossible for the Palestinian Authority to continue to accept these funds. Sami Mshasha, “Urgent UNRWA Statement,” UNRWA, September 1, 2018. The Washington Project, Middle East Forum, 2017. Al Jazeera News Agencies, “Jerusalem to remove UNRWA to ‘end lie of Palestine refugees’,” Al Jazeera, October 4, 2018. Ilana Feldman, Life Lived in Relief: Humanitarian Predicaments and Palestinian Refugee Politics (Berkeley: University of California Press, 2018).